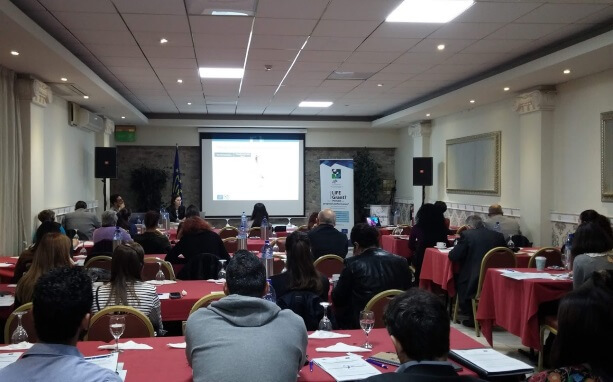 The LIFE Cyclamen team organised a “LIFE Information Day – 2019 Call” in Nicosia on Thursday, April 4th 2019, as a part of the Cyprus Capacity Building LIFE Programme. The purpose of the event was to inform any potential beneficiaries of the LIFE Programme 2019 Call. During the event, the two Sub-Programmes and their thematic priorities were described based on the Multiannual Action Programme for 2018-2020. In addition, participants were informed of the different services the National Contact Point (NCP) offers to applicants, as well as to ongoing or past projects. Useful hints and tips were given regarding capturing and maturing an idea, as well as on writing a successful LIFE Proposal. Mrs. Anita Fassio (EASME) touched upon the new way of submitting LIFE proposals for the Environment sub-programme (2 Stage approach), the Climate Action sub-programme and the evaluation criteria for both sub-programmes. In addition, she informed participants of the importance and characteristics of Close-to-Market (C2M) projects, and explained the reasons the LIFE Programme considers such projects important. An example she shared with attendees was the project LIFE Herotile, which has developed roof tiles with a new shape that helps increase the energy performance of buildings. Mr. Nicos Kassinis, from the Game and Fauna Service, presented the LIFE Bonelli eastMed project. The Game and Fauna Service is part of the consortium of this project, which addresses the most critical threats to Bonelli’s eagle populations in Greece and Cyprus. The overall objective of the project is to ensure the long-term favourable conservation status for the species’ interconnected local populations, through the establishment and operation of the East Mediterranean Bonelli’s Eagle Network (EMBoNet). Mr. Pambos Panayiotou, Director of ATLANTIS Consulting Cyprus Ltd, presented the extensive experience of this SME with the LIFE Programme. Mr Panayiotou mentioned three LIFE Projects, in which they had a supportive role to the Department of Environment. The first project had to do with formulating a national noise policy and designing and implementing of a Noise Policy according to the EU Directive [CYNOISE (LIFE02 TCY/CY/018)]. The second project aimed at moving the country forward in its protection of Sites of Community Interest [COMANACY (LIFE04 NAT/CY/000013)] and the third project dealt with justifying the impact of external factors on air quality (anthropogenic pollution) [PM3 (LIFE09 ENV/CY/000252)]. These three projects had an impact on policy uptake, as they lead to the adoption of the Noise Policy according to EU Directive 2002/49, Habitats Directive (92/43/ΕC) and Birds Directive (2009/147/ΕC) and Directive 2008/50/EC on ambient air quality and cleaner air for Europe. The experience gained from the implementation of the projects, was helpful for knowledge transfer, networking with other similar projects and other MS and created new opportunities for cooperation. Mr. Panayiotou also stressed that the successful proposal is not the one that is approved for financing, but the proposal that leads to the successful implementation and achievement of project objectives within the given resources and timeframe. Mrs. Dafni Mavrommati, from Directorate General for European Programmes, Coordination and Development presented the Information Portal and is a user-friendly central information point, for all programs funded by European and/or National funds that exploited funding opportunities form institutions in Cyprus. Also, she informed the attendees on the budget allocate in Cyprus for the Programming Period 2014-2017. Through the Portal citizens can immediately identify the funding programme and/or the call of the area of their interest, find links to useful sites, useful contact details, see a calendar of events and many more. Lastly, Mr. Stavros Kambanellas, Scientific Officer of the Research Promotion Foundation (EEN Cyprus), presented the Network services and activities, which support the network for Small and Medium-sized Enterprises (SMEs). The Network offers advisory services, advice for international growth, enables international partnerships, provides support for business innovation, and many more. The Enterprise Europe Network Cyprus is a member of the Enterprise Europe Network and it consists of the Research Promotion Foundation as the coordinator and the European Office of Cyprus and the Cyprus Chamber of Commerce and Industry as members. All in all, it was a very constructive event with many new potential applicants, who had the opportunity to ask questions about the LIFE Programme from both the National Contact Point and from the guest speakers.